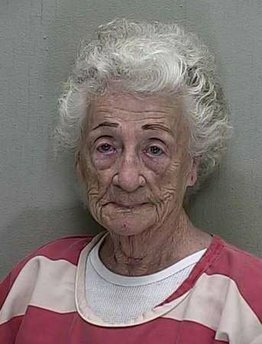 REUTERS - The booking mugshot of 92-year-old Helen Staudinger is seen in this handout released March 23, 2011. The central Florida woman fired a semi-automatic pistol four times at her 53-year-old neighbor's house after he refused to kiss her, police said on Tuesday. When she was questioned, she replied that, "I even offered to put my teeth in but he said, 'Not even if you scrubbed off your eyebrows,' well, I just seen red."